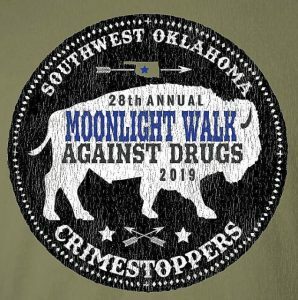 Crimestoppers/Drugbusters of Southwest Oklahoma has several major fundraisers each year. The first fundraiser is the Annual Membership Drive conducted January through April. Anyone who did not have an opportunity to join then can join at any time. Individual memberships are $25.00 and business memberships begin at $100.00. Several contributors give $500.00 or more. For each $50.00 donation, members will receive a Crimestopper/Drugbuster’s supporter decal to place on the windshield of their car or the door to their business. Anyone who would like to be a supporting member can contact Kristie Bolan at the Lawton Police Office by calling 581-3240. If you would like to mail a donation to Crime Stoppers, please send your check or money order (please do not send cash) to Crime Stoppers, P.O. Box 923, Lawton, OK, 73502. Please note in the mailing if it is a donation or a membership. Occasionally, Crimestoppers/Drugbusters may participate in fundraisers other than those listed. All funds raised go directly to pay for the rewards to callers reporting information that leads to an arrest and felony charges being filed against those committing criminal acts in our society and community education and awareness. The purpose of this event is to raise awareness about the effects alcohol and other drug abuse has on our community. The walk allows individuals and/or groups to show their support for the fight against drugs. Show your support by registering your organization for the Team Walk and purchasing the Moonlight Walk Tee shirt for $15. Prior to the start of the Walk, from 6:00 pm-8:30 pm, there will be several static displays and events near the start of the walk located by the Holiday House in Elmer Thomas Park. Our static displays include the Lawton Police Department divisions, Oklahoma Highway Patrol, the Crash Test Dummies, McGruff the Crime Dog, Fort Sill Police and Fire Departments, Comanche County Sheriff’s Department, Lawton Fire Department, other police and fire department vehicles, several drug prevention agencies and more.